There is growing recognition that monetary policy shocks have distributional consequences. An active literature argues that monetary policy can have differential effects across various types of agents – savers versus borrowers (Doepke and Schneider 2006), the financially constrained versus the unconstrained (Williamson 2008), or young versus old (Wong 2016). In turn, the heterogeneity in the impact of monetary policy across agents can determine its overall effectiveness (Auclert 2017, Beraja et al. 2017, Kaplan et al. 2018). Coibion et al. (2017) show empirically that monetary contractions increase both income and consumption inequality. In all of these contributions, the distributional consequences of monetary policy arise from its heterogeneous impact on the value of agents' income or wealth. In a recent paper, we propose and quantify a novel mechanism through which monetary policy shocks have distributional consequences (Cravino et al. 2018). It has been established that goods differ greatly in price stickiness (Nakamura and Steinsson 2008), and the effects of monetary shocks on prices are heterogeneous across goods (Boivin et al. 2009). At the same time, consumption baskets differ across the income distribution (Almås 2012). These two observations imply that monetary shocks will differentially affect the prices faced by households of different incomes. Specifically, households that consume more sticky-priced goods will experience smaller CPI changes following a monetary policy shock than households consuming flexibly-priced goods. We establish that the prices of the goods consumed by high-income households are more sticky and less volatile than those of the goods consumed by middle-income households. Our analysis uses three main sources of data. The first is the US Consumer Expenditure Survey, from which we obtain expenditure shares across detailed product categories for households at different percentiles of the income distribution. The second is the item-level consumer price data from the Bureau of Labor Statistics, which are the most finely disaggregated consumer prices publicly available for the US. Finally, we employ the measures of price stickiness constructed by Nakamura and Steinsson (2008), who report the frequency of price adjustment (i.e. the probability that a price changes in a particular month) for every detailed product category in the US CPI. Figure 1 presents the scatterplot of the weighted mean frequency of price adjustment for households at each of the 20 quantiles of the income distribution in the CES. Thus, each dot corresponds to 5% of households. Mean frequencies of price changes are hump-shaped along the income distribution – middle-income households consume goods with more frequent price changes, while high- and low-income households consume goods with less frequent price changes. For the households around the median – the 40th-60th income percentiles – the frequency of regular price adjustment is 22.16% per month. By contrast, the frequency falls to 19.27% for the households in the 96th to 99th percentile, and further to 16.82% for the top percentile in the distribution. Thus, the weighted mean frequency of price adjustment is some 24% lower for the households in the top 1% of income compared to the households around the median income. Figure 2 plots the standard deviation of household-specific inflation. Inflation volatility is also hump-shaped along the income distribution. The households with middle incomes experience the highest inflation volatility, whereas the lowest volatility is found at the top of the income distribution. The annual inflation rate has a standard deviation of 0.021 for consumers in the middle (40-60th percentiles). By contrast, the standard deviation of annual inflation is 0.015 for households in the 96th to 99th percentile of the income distribution, and 0.013 for those in the top 1% – or 38% lower than that of the CPI of the middle-income households. The biggest expenditure share differences between high- and middle-income households are in items such as gasoline, car insurance, used cars, and cigarettes, for which the middle-income households have the highest relative expenditure shares compared to the top 1%. These are also items that are among the most flexible-priced and volatile in the data. By contrast, the expenditure shares of the top 1% are most tilted towards items such as elementary and college tuition, club membership dues, and domestic services, items that are among the stickiest in price and least volatile in the data. These differences across consumption baskets imply that income-specific CPIs may respond differentially to monetary policy shocks. 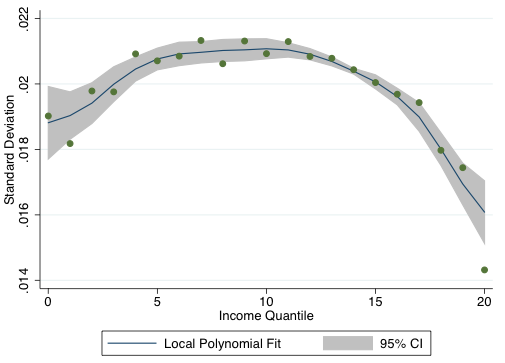 In particular, the CPIs of high-income households should be less responsive to monetary shocks than the CPIs in the middle of the income distribution. Our paper evaluates this hypothesis both econometrically and quantitatively. We first implement a factor-augmented VAR (FAVAR) model – following Bernanke et al. (2005) and Boivin et al. (2009) – that allows us to estimate the impulse responses of a large number of economic series to monetary policy shocks. Our interest is in estimating the impact of monetary policy shocks on household-specific CPIs. We thus include 100 income-percentile-specific CPIs in the FAVAR. 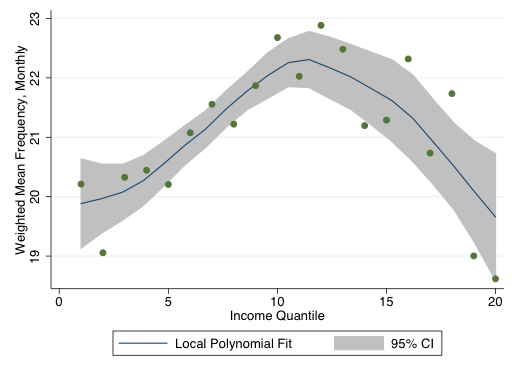 Figure 3 plots the impulse responses for selected income percentile-specific CPIs. The monetary policy shock is a 25 basis-point increase in the Federal Funds rate on impact, thus a contraction. The consumption price indices of the high-income households react substantially less to monetary policy shocks than those for the middle of the income distribution. The difference is economically meaningful. 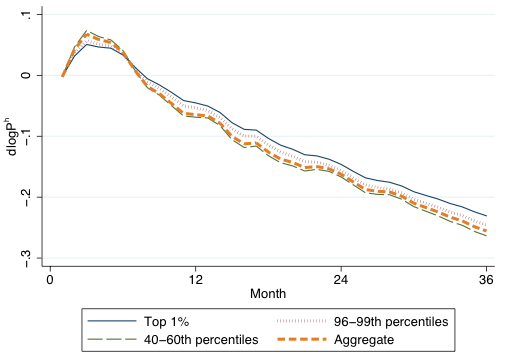 After 12 months, the top 1% households' CPI responds by 34% less, and the 96-99th percentile households by 22% less, than the CPI of the households in the middle of the income distribution (40th-60th percentiles). After 24 months, the differences are still 12% and 6%, respectively. Finally, we perform a quantitative assessment using a multi-sector, multi-household New-Keynesian model with Calvo-style nominal rigidities. In the model, sectors are heterogeneous with respect to their price stickiness, and households are heterogeneous with respect to their income levels and consumption baskets. We calibrate the model to the observed levels of price stickiness and observed cross-household differences in consumption patterns, and simulate the model's response to a monetary policy shock, paying special attention to how a monetary shock differentially affects households. As expected, high-income households' CPIs respond less to a monetary policy shock than middle-income households' CPIs. The difference is once again quantitatively large – after 12 months, the CPI of the households in the top percentile of the income distribution responds by 13% less than that of the middle-income households. We also show that shifting the distribution of income towards households that consume more sticky goods (i.e. more income inequality) would increase the effectiveness of monetary policy, although this effect is modest for realistic changes in inequality. It has been known since at least Engel (1857, 1895) that households with different incomes consume different goods. Our recent research documents two novel patterns of how consumption baskets differ – in the US, households at the top of the income distribution consume more sticky-priced goods, and face substantially lower overall inflation volatility than households in the middle of the income distribution. Because the prices of goods consumed by the high-income households are less responsive to monetary shocks, the overall CPIs of those households will react less to those shocks. This suggests that high-income households’ consumption baskets insulate them against monetary disturbances. By contrast, middle-income households face prices that are both more volatile, and more exposed to monetary policy shocks. Our results indicate that the distributional consequences of monetary policy shocks are large relative to the aggregate impact of monetary policy on prices – a shock that increases inflation by 1% after a year also generates a -0.2% difference in the inflation faced by households at the top versus the middle of the income distribution. Almås, I (2012), “International income inequality: Measuring PPP bias by estimating Engel curves for food”, American Economic Review 102(2): 1093–1117. Beraja, M, A Fuster, E Hurst and J Vavra (2017), “Regional heterogeneity and monetary policy”, Quarterly Journal of Economics, forthcoming. Bernanke, B S, J Boivin and P Eliasz (2005), “Measuring the effects of monetary policy: A Factor-Augmented Vector Autoregressive (FAVAR) approach”, Quarterly Journal of Economics 120(1): 387–422. Boivin, J, M P Giannoni and I Mihov (2009), “Sticky prices and monetary policy: Evidence from disaggregated US data”, American Economic Review 99(1): 350–84. Coibion, O, Y Gorodnichenko, L Kueng and J Silvia (2017), “Innocent bystanders? Monetary policy and inequality”, Journal of Monetary Economics 88(Supplement C): 70–89. Cravino, J, T Lan and A A Levchenko (2018), “Price stickiness along the income distribution and the effects of monetary policy”, CEPR Discussion Paper 12967. Doepke, M and M Schneider (2006), “Inflation and the redistribution of nominal wealth”, Journal of Political Economy 114(6): 1069–1097. Engel, E (1857), “Die Produktions- und Ernteerträge und der Getreidehandel im preussis- chen Staate,” Zeitschrift des Königlichen preussischen statischen Bureaus 2: 249–89. Engel, E (1895), “Das Lebenskosten belgischer Arbeiterfamilien früher und jetzt,” Bulletin de Institut International de Statistique 9: 1–124. Kaplan, G, B Moll and G L Violante (2018), “Monetary policy according to HANK”, American Economic Review 108(3): 697–743. Nakamura, E and J Steinsson (2008), “Five facts about prices: A reevaluation of menu cost models”, Quarterly Journal of Economics 123(4): 1415–1464. Williamson, S (2008), “Monetary policy and distribution”, Journal of Monetary Economics 55(6): 1038–1053. Wong, A (2016), “Transmission of monetary policy to consumption and population aging”, Princeton University, Mimeo, April.